In 1759 a James Milliken owned plantation Oranjesteyn in Essequibo. He cannot with certainty be identified with James Milliken [II] below, but they may be the same person. In 1794 a Thomas Milliken sold Oranjestein and intended leaving the colony [Essequebo en Demerarische Courant, 1 June 1794]. James Milliken [II] had no son Thomas and the identification of this person is unknown. In 1798 Oranjestein was owned by Milliken & Nugent. James Milliken [I], was a soldier, planter, slave owner and sugar merchant on Nevis and St Kitts. He retired from the colonies to Scotland in 1729, purchasing and developing an estate and country house in Kilbarchan Parish in Renfrewshire. He died in 1741. His son James Milliken [II] was born in 1710 on the island of Nevis and returned to Britain to be educated, although his parents remained in the colonies. He was looked after by his father’s contacts in London and was at Eton in 1726. James went back to St Kitts in 1729 to manage the family estates but was back in Scotland by 1742. He was a partner in the South Sugar House in Glasgow and rector of Glasgow University from 1759-61. He died in 1776. 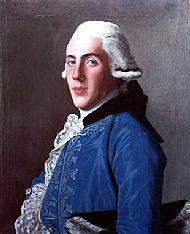 This portrait of his son, James Milligan [III], was painted in 1762 by Jean-Etienne Liotard, while James was on the ‘Grand Tour’ of Europe and shortly before his death of fever in Venice.